and playing with this crazy girl. I was also able to catch up on a lot of house and general life stuff that I needed to get organized. Getting back into the swing of things after being off of work for two weeks is tough, but I'm feeling like I'm back in my routine this week. Despite the fact that Richmond is clearly having some cold-weather commitment issues, it is actually starting to feel like winter here! In fact, there were a few days this past week that were downright freezing - and I loved every second of it. Having grown up in a place where the seasons range from hot to slightly less hot, I'm all about the winter chill. Bring on the snow days, hot buttered rum, and chili! Beside the rum and the snow, one of my favorite things about the winter is winter food, especially soup. I make soup pretty much every week and never get tired of it since there are so many different types to try - there are Asian inspired soups, classics like chicken noodle soup, and one of my favorites, lentil soup. I could eat lentil soup every day for the next few months and not grow tired of it. 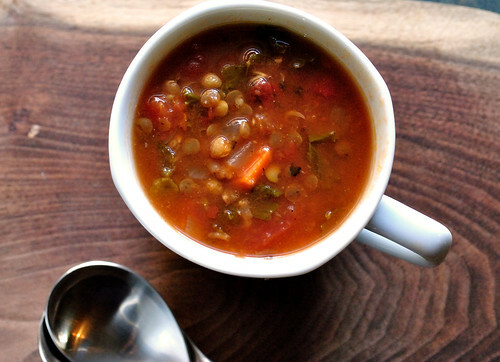 There are several variations on lentil soup ranging from Italian inspired to spicy Moroccan renditions and this soup falls somewhere in between. It's tomato-based but full of fresh ginger and warm spices, which make it the perfect lunch or dinner on a cold or you know, 55 degree, winter day. This recipe makes an extremely large batch, so consider portion out some for the rest of the week and freezing the rest for later. You will be glad you did! Yields: 10-12 servings. It's great to freeze! And it's vegan! 1. Cook your lentils according to package instructions. Drain and set aside to cool. 2. In a very large soup pot, heat up olive oil over medium heat and add onions. Saute for about 5 minutes until just transculent – don’t let them brown..
3. Add garlic and ginger. Saute another 3-5 minutes until fragrant. 4. Add carrots. Sprinkle vegetables with salt and cover pot with lid. Cook, stirring occasionally for about 10 minutes until they vegetables are slightly soft. 5. Add diced and crushed tomatoes, lentils, bay leaves, spices, and lentils to pot. Add water or vegetable broth. 6. Bring to a boil, then reduce to a simmer. Simmer very slowly for about 1 hour. 7. Add kale leaves and simmer another 10-15 minutes. 9. Serve with a drizzle of good olive oil, a dollop of plain yogurt, or anything else you wish!